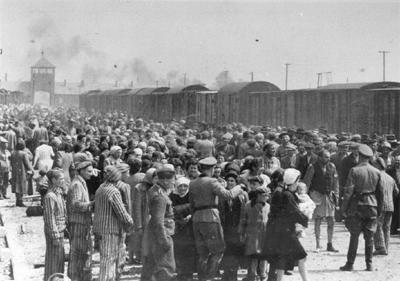 Holocaust Survivors: Photo Gallery - "A Woman Sent to be Gassed at Auschwitz"
From \"The Auschwitz Album\", the only photographic documentation of the entire extermination process at Auschwitz. An SS has just sent the woman with the infant to join those being sent to the crematoria; her hair is covered in the tradition of the Orthodox Jewish wife. A man is standing between the columns missing his pants and one shoe; this was a common occurrence in the overcrowded boxcars. On the left stand inmates in striped camp clothing. The main gate to Birkenau camp under which the trains pass is ar the rear left of the photograph.